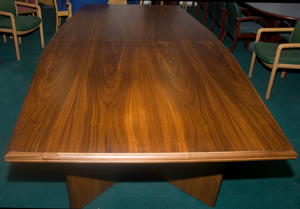 Most of the wood veneer executive, boardroom or reception furniture we sell has had the benefit of being fully stripped and polished prior to delivery. Prices shown on our website all allow for a full strip and polish. If you are happy to take the individual piece of furniture without it being totally transformed we will be happy to discuss a proportionate reduction in price. We are able to recover most soft seating in a choice of fabric or leather. We have our own expert in house french polisher who is often able to totally transform your existing furniture.